Morgan Aste of France won the overall Men’s Bodybuilding title as more than 700 of the top amateur competitors from around the world competed in 10 divisions at the 13th Annual Arnold Amateur NPC International Championships. The Classic Physique Overall Winner was Abtin Shekarabi from Iran. FRENCHMAN MORGAN ASTE WINS OVERALL MEN’S BODYBUILDING TITLE! Morgan Aste of France won the overall Men’s Bodybuilding title as more than 700 of the top amateur competitors from around the world competed in 10 divisions at the 13th Annual Arnold Amateur NPC International Championships. 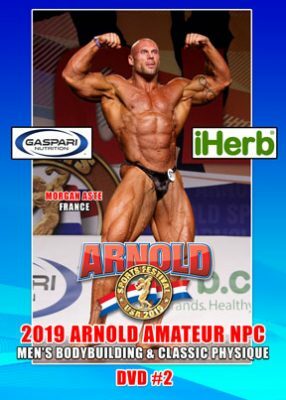 COMPLETE 2019 ARNOLD AMATEUR NPC MEN’S RESULTS FOR ALL CLASSES. THE MEN’S RESULTS AS SEEN IN THIS DVD. Men’s Bodybuilding Overall Winner – Morgan Aste – France.